If you perform a variety of athletic activities, ranging from aerobics to sports, a cross-training shoe may be right for you. While some shoes are created for specific activities, such as walking, running or tennis, a cross-training shoe provides a versatile option that can meet the needs of the exerciser who likes to mix up her workouts. Follow these fit and function tips to ensure you purchase the right pair for you. Pinpoint the cross-training shoe section in your shoe store of choice. While these shoes are typically marked, you may need to ask a sales professional to confirm that the shoes you are looking at or trying on can meet your cross-training needs. Select several shoes in differing brands to try on. Because each brand may offer a different design and model of a cross trainer, it's important to try on several kinds to identify which type will be best for you. Test the fit of each shoe. This can be accomplished by wiggling your toes (you should be able to fan your feet out and wiggle the toes); identifying where the top of the toe is in relation to the top of the shoe (there should be a thumbnail's length of space); and the heel should feel secure and supported while wearing the shoe. Consider fit issues related to the shoe and make sure you try on each shoe with the socks you would be wearing during exercise. For example, walk across the room. Does your foot feel cushioned and supported? Is the foot lightweight enough to perform your activities of choice? Also, does the foot feel stable while moving (the foot doesn't feel as if it is wobbling or slipping out of the shoe)? If you answered no to any of these questions, the shoe is not for you. 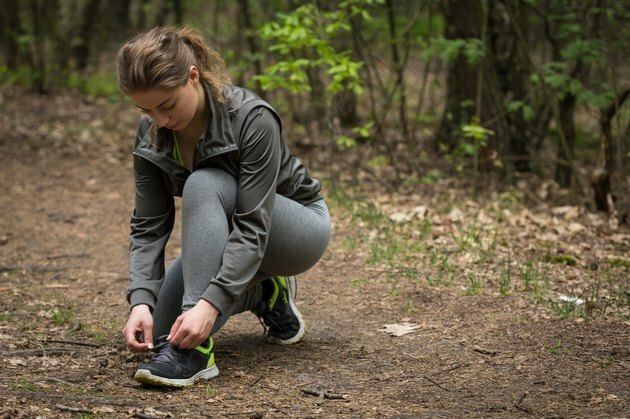 Signs it's time to purchase a new pair of cross-training shoes include if you notice unevenly worn soles or the backs of the shoes appear to be broken down. While it's recommended you throw out many shoes after 300 miles, a cross-training-shoe wearer should think in terms of hours. Replace your pair after wearing for more than 100 hours. Avoid thinking that you may be able to "break in" your cross-training shoes. The shoes you select should feel comfortable and stable from the moment you try them on to your 50th hour wearing them.